A tall frosty pint of Lost Coast Pale Ale, a welcome start to a North Coast brew tour. If Portland, Ore. is the undisputed capital of America’s brew culture, than I have to say California’s North Coast is its sleepy, oft-ignored younger brother. The North Coast, which includes Humboldt County and its two largest cities Arcata and Eureka, may be best known as a pot grower’s paradise but the region is also home to some of the finest small breweries in the nation. I recently got a chance to skip out of Napa for a quick weekend to savor the last bit of my summer freedom before the onslaught of harvest begins at the winery. My tour guide for the weekend was my good friend Brendan who has lived in the Arcata area for almost a decade. He’s a fellow Sonoman and was the best man at my wedding. He’s usually hunting on fall weekends, but decided to put down his bow and arrow to show me the brew scene in his neck of the woods. I arrived late on Friday night, and after a night of reminiscing and talking about how country music lost its way, Brendan and I woke up early in the morning for a quick round of golf at the Eureka municipal course. Golf is a fickle pursuit. I try to play about every two weeks so I was feeling confident. Brendan plays about once or twice a year and he beat me by seven strokes. It was one of those days out on the links when about anything that could go bad did, and when something went good I was just making ground back from the last mistake. Needless to say by the last hole I was ready to start the brew tour. Our first stop was Lost Coast brewery, probably the best known and most celebrated of the North Coast brews. 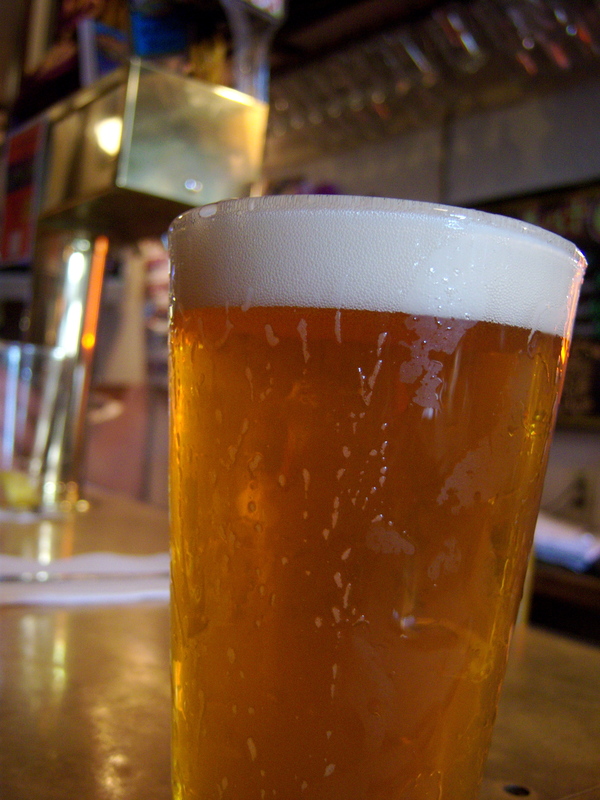 This brewery is located in downtown Eureka and serves a wide selection of ales that includes their well-known Downtown Brown and Great White. The brown is a wonderful example of the classic Brown Ale variety that packs a subtle hop punch in the finish. The Great White is ostensibly a Belgian white but it has less aromatics and coriander spice taste with more German hoppiness. The Great White can fluctuate in quality but on the whole it generally is a crowd pleaser. I couldn’t believe the number of folks who joined us at the crowded Lost Coast bar and when deciding what to drink asked if the brewery had “anything light?” I don’t know why you would got to a brewery and inquire to drink something light. I guess they just wanted to try something new, but didn’t want to get to far out of their comfort zone. Most of them seemed to be making road trips on 101 and actually most of them seemed like they were from southern California. Probably Dodgers fans. And they probably prefer lite beer. Bastards. 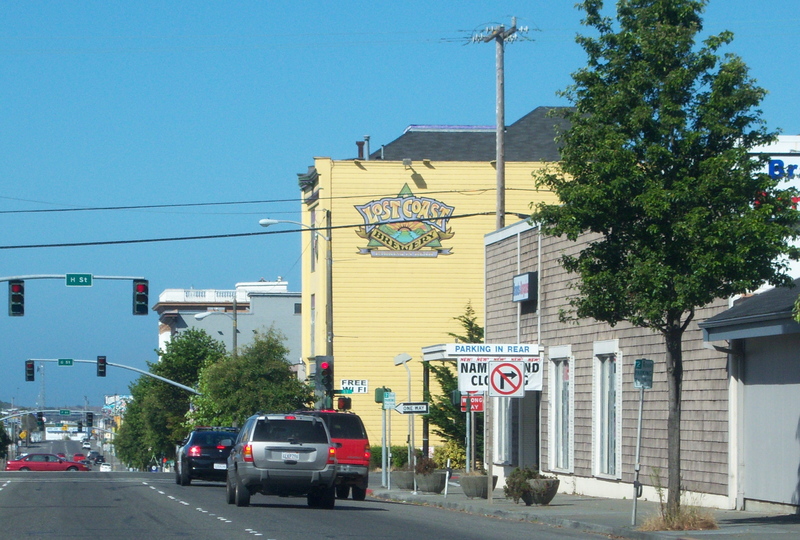 Downtown Eureka is home to the Lost Coast brewery, one of the best and best known beermakers in the area. Our next stop was Humboldt Brewing, but we quickly learned they no longer make their own beer, but do offer about 30 beers on tap. We had a quick pint and got to talking about the strangle hold pot growers have on the economy and society in Humboldt. It’s a shame that a small group of ponytailed oligarchs are holding the region back, but Prop. 215 may change all that. The next stop was Mad River Brewing. This brewery is located in the small community of Blue Lake just outside of Arcata near the 101 intersection with 299. This turned out to be my favorite spot of the day. The brewery is located in a small industrial park situated near a pulp mill. It seemed truly emblematic of the North Coast to be sitting in a beer garden with a bunch of college kids almost in the shadow of a mill drinking craft beer. Mad River is a hop head’s type of brewery. They have a wonderful selection of IPA’s that all exhibit the full range of hop flavor from grit your teeth bitterness to wonderful notes of citrus. They have a limited distribution but if you can find a 22 ounce or six pack in your store give it a try. Another great brewery in the area is Six Rivers. Brendan and I visited this joint during a hunting trip last year so it wasn’t on our itinerary this time around but on my most recent visit I was able to try their porter and found it to be delightful. Most porters can be just a little too much smoky malt and little hops. Six River’s porter had a wonderful balance and a really crisp finish. 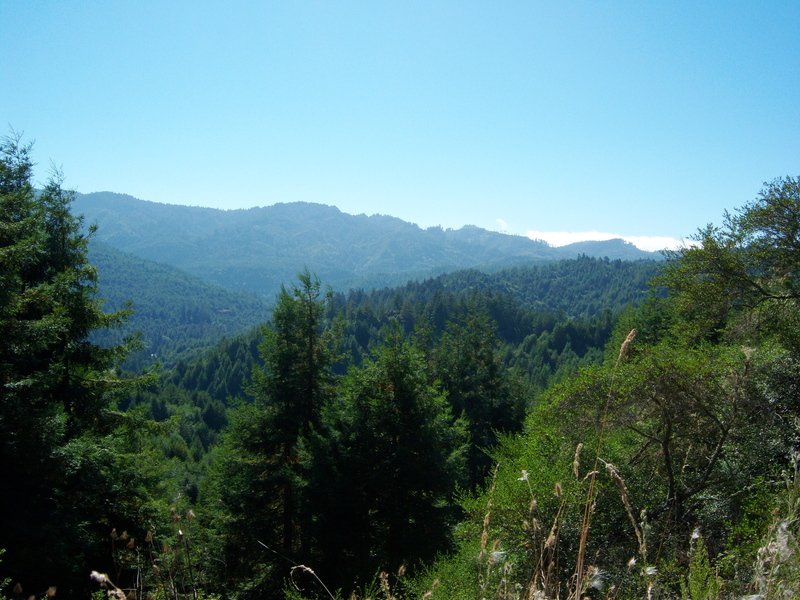 The view from a hillside a few miles outside of Blue Lake in Humboldt County. But a trip to Humboldt wouldn’t be complete without heading up into the mountains. Brendan is a field biologist for a resource company in the area and took me out to a remote area where he’s conducting a study on spotted owls. We had a box of mice in the back of the truck and I was all jazzed for some great photos of me feeding a wild, Humboldt spotted owl, but after about 20 minutes of hooting, screeching, whistling and whooping on Brendan’s part to call in the owls we had no luck. After the brew tour, Brendan and I went to downtown Arcata for a great dinner at the Plaza Grill. I had a huge platter of ribs and he had the sensible, heart-healthy seared tuna served over wild rice. As we made our way around the plaza, I was able to talk him into a quick drink at Everett’s. Well, a “quick drink” is never really that quick and after I had started on the Jameson’s and bought him a shirt, I tried to get him to go for a visit to the Tip Top club, but it was to no avail. I guess that’s why they call me full throttle. They've got big trees up there dude. No really, like totally huge bro. The next day I woke up to find the fog breaking up early, at around 9 a.m. Usually the coastal towns can stay socked in until 3 p.m. I took the opportunity for a quick five mile run to savor the fresh air and ocean breeze. 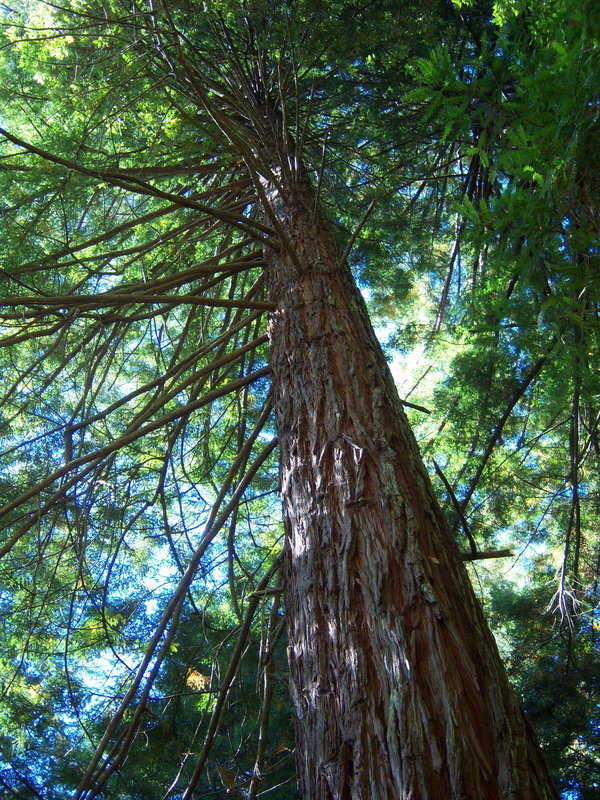 The pleasant and clear weather made for a wonderful drive back down through the Redwoods on 101. I always love visiting the North Coast. It’s definitely not part of the Bay and it’s not really pure Northern California — like Redding, Chico or Red Bluff — and it’s also got a much different vibe than Southern Oregon. I’m not sure if I’d love it that much if I lived there year round, the politics and marijuana growers would get old, but it sure is nice to visit. A big part of making those visits pleasurable is the vibrant and creative brewing scene. (Update, Sept. 21, 2010, correction that’s Prop 19, not Prop 215. I do recall voting from Prop. 215 back in the day, actually it may have been my first election. I also voted for Dennis Peron too. Next Post → Drinking Jungle Juice in Harlem?